Barry Mason from Burnie dropped in to Mood Food at Kempton the other day driving an eye-catching Dean Edwards' 2007 Eagle 9200 with a 550 Signature Cummins up front and towing a fridge pan from Hobart to Devonport to catch the TT Line ferry Spirit of Tasmania, and then home and knock off for the day. He tells us he has been driving for Dean for three years now, and that means two years with "the Shed", and he reckons you couldn't find a better outfit to work for. 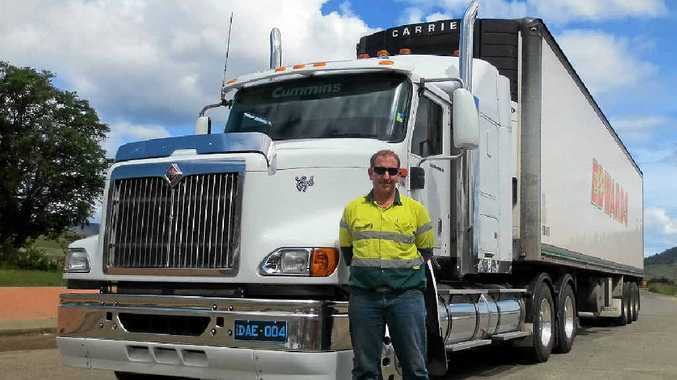 Barry also likes the Eagle which he describes as a "brilliant truck". He tells us the Brighton By-Pass will be better when they raise the speed limit, (as promised), the current 80km being unrealistic on such a good dual lane divided road, and like everyone he is interested in the major renovations and truck parking going on at Mood Food, it all promises well for the future.